I am far from London, standing below a lighthouse on a naturally-formed sandbar that juts out to sea in the south of Spain. The strong winds coming in off the Atlantic, combined with hot temperatures and fine beaches make the area a Mecca for wind-surfers and kite-enthusiasts from all over Europe. This point lies about equidistant between two of Europe’s most historic harbours. Just to the south is Tarifa, from where in previous centuries pirates demanded payment from ships passing between the Mediterranean and the Atlantic, most likely giving us the English word ‘tariff’. From there the mountains of the North African coast stand high, separated from Spain by what seems only the width of a large river. A short drive to the north is the harbour of Cadiz, Europe’s oldest continually-inhabited town, which was already ancient when the Romans came to occupy it and from where Christopher Columbus made some of his voyages to the New World. This is Capo de Trafalgar, or Cape Trafalgar, and the momentous conflict that took place at sea, just out on the horizon, on 21st October 1805 gives its name to our most famous London square. 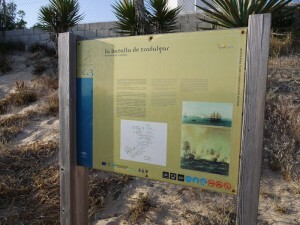 Now a signboard in Spanish and English stands below the lighthouse and faces out to that point, giving some explanation of the battle but without mentioning winners and losers or the legacy that the day left other than the number of casualties. Earlier this year we experienced in London the royal wedding of Prince William and Kate Myddleton and marveled at the vast crowds and huge interest in the event from around the world. Royal events such as coronations, marriages and funerals – and the restoration of the monarchy upon the return of Charles II in the 17th century – have long been of great popular interest, involving grand processions through the streets of the capital, accompanied by celebrations or bereavement around the country. 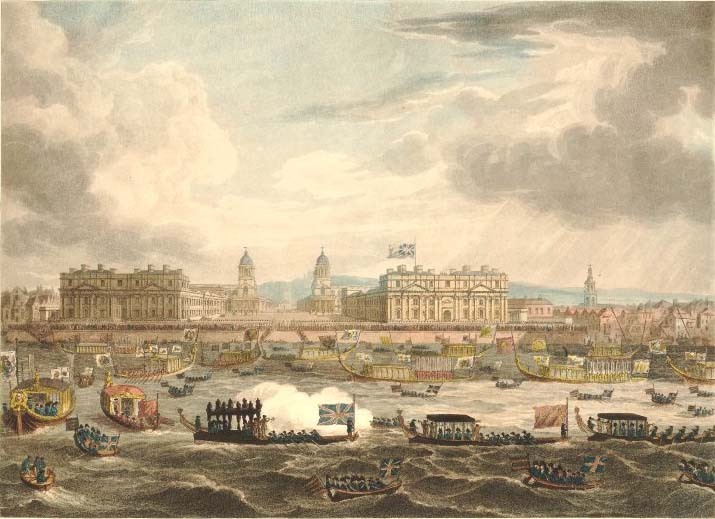 What was remarkable about the funeral of Lord Nelson in 1806, and what made it unique at that time, was the sheer scale of the event and the public grief for a ‘mere’ commoner. 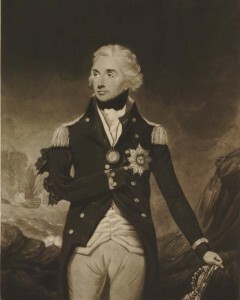 Nelson’s fame and reverence were due to not only his great naval victories – particularly at the Battles of the Nile and Trafalgar – but also the manner in which he achieved his success. He was not a leader who commanded from a safe distance, instead directing without heed to his personal safety. He earned great respect from those he commanded as well as the acclaim of the British people, although not necessarily amongst some in high command. On occasions he defied orders, such as the famous occasion during the assault on Copenhagen in 1801 when he put his telescope to his blind eye and was thus unable to see the command from Admiral Sir Hyde Parker to retreat from battle. His exploits cost him an eye, then an arm, and finally his life. It was not simply gung-ho exhibitionism: Nelson was a highly intelligent, yet unconventional, naval tactician of the highest order. Norfolk-born Horatio Nelson spent his entire career in the navy, having joined as an ordinary seaman aboard a ship captained by his uncle at the age of twelve. His first experience of combat came at the age of seventeen and he was only twenty when he took his first command of a ship in the American War of Independence. During the French Revolutionary War he was involved in a great deal of action in the Mediterranean, losing the sight of his right eye attempting a landing at Corsica. He was in command during the capture of several Spanish ships during the Battle of Cape Vincent. That outstanding success brought him to the attention of the British public for the first time and earned him a knighthood. He was hit by gunfire during the unsuccessful attempt to capture the Spanish port of Santa Cruz de Tenerife, ordering the amputation of his right arm so that he could immediately return to battle. On his arrival back in England he was given a hero’s welcome and the Freedom of the City of London. Prior to Trafalgar Nelson’s greatest success came in the summer of 1798 when he led the destruction of the French fleet at the Battle of the Nile, leaving the French commander, Napoleon Bonaparte, stranded. When the news arrived back in England there were great celebrations, with church bells rung and public feasts. Nelson was fêted and elevated to Baron Nelson of the Nile. Later that year he was awarded the title ‘Duke of Bronté’ by the King of Naples and after the Battle of Copenhagen in 1801 he gained the rank of Viscount. With the outbreak of the Napoleonic War in 1803 the country was under the very real threat of invasion by Napoleon, who had assembled one hundred and sixty thousand men along the Atlantic coast. In Britain a volunteer force was recruited and a string of defensive Martello towers constructed around the coast but it would have been no match for the French if they could have crossed the Channel. Nelson was given command of the Mediterranean fleet, with HMS Victory as his flagship. In September 1805 information was received that French and Spanish fleets had joined forces and were anchored at Cadiz where they had gathered to support the invasion. Nelson remained on deck during the subsequent battle, with fatal consequences. Twenty French and Spanish ships were destroyed or captured without the loss of a single British vessel. It was one of the great British victories of the Napoleonic Wars and 21st October was celebrated as the Trafalgar Day public holiday throughout much of the British Empire until the end of the First World War. News of the battle and Nelson’s death finally reached London two weeks after the event, on 6th November, and the country went into mourning for the popular hero. Deaths in battle were normal but no-one anticipated that of the acclaimed commander and there was a general shock around the country and beyond. On being told, King George III is said to have commented: “We have lost more than we have gained”. That was certainly high praise considering what had been achieved was the devastation of much of Napoleon’s navy, the ending of the possibility of invasion, and (it could be argued) British dominance of the world’s oceans for the following century. George and the government agreed Nelson’s should be a state funeral, the first awarded to a commoner and still one of only three that have ever taken place in this country (the others for the Duke of Wellington and Sir Winston Churchill). The manner of Nelson’s death in such a dramatic and heroic fashion in the midst of battle transformed him from a national hero of his time into a legend whose name would live on forever in British history. We may imagine that souvenirs for national events are a modern phenomenon but commemorative mugs, plates and other merchandise were soon on sale, many immortalising Nelson’s pre-battle message to his men: “England expects every man to do his duty”. Sailors killed in battle were normally buried at sea but due to his rank and the esteem in which he was held it was felt proper that Nelson’s body should be brought back to England. It was initially preserved in a ‘leaguer’ (a large casket) filled with brandy, camphor and myrrh, lashed to the mast of the Victory as it sailed back to Gibraltar where the ship underwent repairs. From there the ship continued to Portsmouth, then to the naval station at the Nore at the mouth of the River Medway where it meets the Thames Estuary. Before arriving, and while still in the English Channel, a doctor removed the fatal bullet from the body and it is still kept at the National Maritime Museum at Greenwich. Following the Battle of the Nile Nelson had been presented with the mainmast of the French flagship L’Orient, which he had stored at his chosen undertakers to be used to make his coffin upon his death. It was at the Nore that his body was transferred into that casket. The wooden casket was then sealed in an outer lead coffin before continuing upriver. After news of Nelson’s death had reached London at the beginning of November plans began for his funeral, with various parties involved, including King George, the Admiralty, the Home Office, the Office of Works, the Archbishop of Canterbury, the Dean of St.Paul’s and Nelson’s brother William. The King chose the royal undertaker, the ironically named Mr. France, to carry out some of the arrangements. (His successors in the undertaking business, A.France & Son, remain proud of their association with the event as can still be seen by the window display at their branch at 45 Lambs Conduit Street). When it was decided that Nelson would be laid to rest at St.Paul’s its Surveyor, the engineer Robert Mylne, swung into action with plans for the funeral service and burial. At Greenwich the lead coffin was placed inside a much grander outer coffin made from mahogany and decorated with ten thousand gilt nail-heads forming pictures of Nelson’s achievements, specially constructed in London. For three days, from 5th to 7th January 1806, it lay in state in the Painted Hall of the Royal Hospital at Greenwich, surrounded by captured French and Spanish flags, and with the hall’s walls shrouded in black drapes. Thirty thousand people filed past. On 8th January the coffin was taken in a ‘Grand River Procession’ up the Thames to Whitehall, accompanied by naval dignitaries and a large flotilla of gilded Livery Company barges. It was carried on the royal barge originally built for Charles II, with the gilding covered in black velvet and the canopy decorated with black ostrich feathers. (The barge is today preserved at the Royal Naval Museum at Portsmouth). Cannons were fired from along the way as the funeral barge passed and ordinary people crowded on to the bridges and riverbanks for a view of the passing spectacle. The disembarkation took place at Whitehall Stairs, between Charing Cross and Westminster, and then on to the Admiralty building where the coffin lay overnight. The following day Nelson was taken in procession through the streets of London to St.Paul’s Cathedral on a horse-drawn funeral cart designed to look like the Victory. (After the funeral it remained at the Painted Hall until dismantled in 1840. The figurehead is now at the National Maritime Museum). The procession, led by the Duke of York, was so long that those at the front had already reached the cathedral before the rear had departed from Whitehall. It included the Prince of Wales, the Dukes of Cumberland, Kent and Clarence, thirty two admirals, over one hundred captains, forty eight seamen from HMS Victory, forty eight pensioners from the Royal Hospital at Greenwich and thousands of troops. Huge numbers of people lined the streets to watch the parade – possibly hundreds of thousands if contemporary pictures are accurate – with stands for spectators erected at advantageous points. There were however some notable absentees: nineteen Admirals declined the invitation to attend, including Earl St.Vincent who had been Nelson’s commander at the Battle of the Nile. They were probably amongst those in the naval hierarchy who felt that Nelson had achieved his successes through disobedience to his superiors, or perhaps disapproved of his well-known affair with Emma Hamilton. There was also some controversy and diplomatic manoeuvring regarding the attendance of the Prince of Wales. King George was anyway precluded from attending by the long-standing convention that monarchs do not take part in the funerals of commoners. The Prince had therefore requested to lead the funeral but during his lifetime Nelson had a rather low opinion of him. Additionally the procession was passing into the City of London where the Lord Mayor has precedence over all bar the sovereign. Arriving at St.Paul’s the coffin was carried into the cathedral by twelve seamen from HMS Victory. It was placed under the great dome where large stands had been erected for the multitude of attendees admitted by ticket: perhaps as many as seven thousand. Suspended from the dome was a huge lantern, specially made from one hundred and thirty individual lamps, illuminating the ceremony below. Those captured French and Spanish ensigns hung from the galleries. Hymns were sung by men and boys from the choirs of St.Paul’s, Westminster Abbey, St.George’s chapel at Windsor, and the Chapel Royal. Among those attending was the French Admiral Villeneuve – commander of the French and Spanish forces at Trafalgar who had been captured during the battle – and Nelson’s estranged wife Fanny but his relationship with his mistress Emma Hamilton was always controversial and she was not invited. The Archbishop of Canterbury had decided that Nelson should be buried above ground in the crypt immediately below the dome. No doubt due to the large size of the triple-coffin it was impractical to walk it down the stairs so a hole was cut in the cathedral’s floor through which it could be lowered at the end of the lengthy service. In the crypt the coffin was to be encased in a sarcophagus, made of granite slabs. The funeral was something of a windfall for staff at the cathedral. In the days prior to the ceremony they had been charging large numbers of curious visitors to witness the preparations. More money was to be made after the event. The coffin was lowered to just below floor level to give the impression it had been placed in the sarcophagus but was instead left hanging for the next two weeks while the enterprising staff made further profit from sightseers until a complaint was published in the letters column of The Times. The tomb as it stood immediately following the funeral was not as it now remains today however. The government’s Surveyor General, James Wyatt, produced some designs for further embellishment, none of which found favour. Two hundred and fifty years earlier Cardinal Wolsey had commissioned the Florentine renaissance sculptor Benedetto Rovezzano to create a sarcophagus, to eventually be used for his own tomb. When Wolsey fell foul of Henry VIII the work was expropriated and kept at Windsor Castle but failed to find a purpose. About ten years after Nelson’s funeral a black and white marble plinth was added to his simple granite tomb, on top of which was added Wolsey’s sarcophagus surmounted by a marble cushion holding a viscount’s coronet. Nelson’s death coincided with existing plans to honour politicians, naval and military heroes with statues in the otherwise rather bare interior of St.Paul’s. The Royal Academy made recommendations but at the request of Nelson’s family a lucrative commission was given to the talented sculptor and former Wedgewood designer John Flaxman who produced the statue in the cathedral’s south transept, completed in 1808. A tomb under the great dome of St.Paul’s and an impressive statue in the body of the cathedral remain as lasting memorials to the greatest British naval hero. Yet they were hardly on the grand scale of what was yet to come in the following decades, with which I shall continue in the second part of this article. First published by London Historians, August 2011.